Great wine requires poor soil and difficult weather. My son is me without the filters. But he’s also like no one I’ve ever met. I like people who struggle. I don’t want to talk about things in the morning. At least not before coffee. My friends have begun to get vasectomies. I’m hoping it’s not a thing. I like to bring order. Pulling weeds makes me happy. I have little patience for chaos. I tend to blame others. There is a theory that at some point during our evolution we were actually amphibious, hence the webbing between our thumb and forefingers, our relative hairlessness, and the happiness we find near water. I regularly dream of the ocean, although it is usually dangerously turbulent. Bread dough, forced by cold air to rise slowly , creates a richer, more flavorful bread. I can walk into a bar, and in thirty minutes have a new friend. Of course, I’ll probably never see them again. Which brings us back to the whole friend issue. Wines produced at high altitudes, on cold, barren outcrops, and in the least promising soil, seem to be the ones I like best. Cold showers always make for a better day. As does a morning run. I find wine both delicious and fascinating. I find Amy both delicious and fascinating. I have no desire to sleep with wine. If I go from running not at all, to running a lot, I get injured. If I build up slowly, I’m OK. It is possible that a lovely mansion built on a rise overlooking a bay will, in a hundred and fifty years, stand empty amidst warehouses, garbage trucks, and sewage treatment facilities, impossible to sell. Time is fleeting and context is all. I love the idea of sourdough more than the actual bread. The process is more interesting than the taste. He may be smarter than me. But he is not as smart as he thinks. When it comes to people, Hallie may be smarter than us all. The very word, disability, is limiting. I may not be a Bordeaux guy. I may actually lean Pinot. But, of course, Italy will always have my heart. Up north. In the mountains. Although it’s a fine line. I can no longer read by the light of my bedside lamp without holding the book up to my nose. And then I have to squint. It is possible to drink wine just about every night. It is possible to do sit-ups with your daughter sitting on your belly. As long as there’s no jumping up and down. I’m a pretty good husband. I suspect I’ve become a better actor while acting not at all. My emotions have become more accessible. In fact, I’m often so tired I cry. Money is not as important as it seems. I am horrible with names. I’m a creature of routine. They mean less and less to me. There’s not that much I want. And I certainly don’t want to give something meaningless to others. When I’m ebullient I feel I say too much. When I’m not I say too little. Silence is comfortable. But things seem to build up, like water behind a dam. Today is my father’s birthday. He would have been seventy-three. OK, maybe it is about me. We sat on the back steps and watched the lightning play across the sky. Tim was with us for a time, but then he went inside, leaving Heath and I alone, counting the seconds between lightning and thunder. Heath has always feared storms, demanding that blinds be closed at the lightning’s first flash, and burying himself beneath pillows when the thunder begins to roll. But tonight I had a hunch. “No!” came the reply, muffled beneath the sofa cushions. I let it go, stepping out into the darkness, only to return a few minutes later. “Really?” he asked doubtfully, peeking from beneath his shelter. And suddenly, surprisingly, he was at my side, a boy-sized bundle of curiousity and trust. He stayed close as we walked out onto the back deck. As a child, I would snuggle down as storms blew in off Lake Michigan and the freshwater wind whipped the sheer cotton curtains over my little double bed. The thunder would crack, impossibly loud, and my heart would jump as I clenched my eyes shut; relaxing again only as I listened to the waves roaring in the distance, imagining them creeping across the sand, and up to our very door. A tornado once dropped a car into my grandparents’ front yard, it’s panicked driver bolting through their living room and into their basement, passing on the way my grandfather, calmly watching his beloved Detroit Tigers. And I remember the Fourth of July when lightning mingled with the fireworks. Later that night the sirens sounded and we made our way to the basement with our pillows, blankets and portable radio, waiting sleepily until the storms had passed. Mom was up early the next morning to visit dad in the hospital. He was coming home in a few days. We watched the dark clouds move in from the southwest. I had told Heath that that if he counted the time between the lightning and thunder, he’d know how far off the storm was. He loved this, and clung to the knowledge fervently, insisting that I begin to count out loud whenever the lightning crackled, and then nodding sagely when he heard the thunder. “The center of the storm is four miles away.” he’d say. “That’s right,” I said. And then we’d wait to start again. My mom didn’t find my dad that morning. She walked into an empty room. He had died during the night. While we were huddled in the basement, listening to the radio, and waiting for the world to calm, he had pulled aside his covers, gently stood up, and made his way to the window. I see him so clearly sometimes. Standing by that window, seeing his reflection in the darkness, and then looking beyond it. Watching the storm, missing his family, and listening to the rain. Hallie’s walking now, and as I follow her through her days, I can’t help but wonder what’s going on in her head. 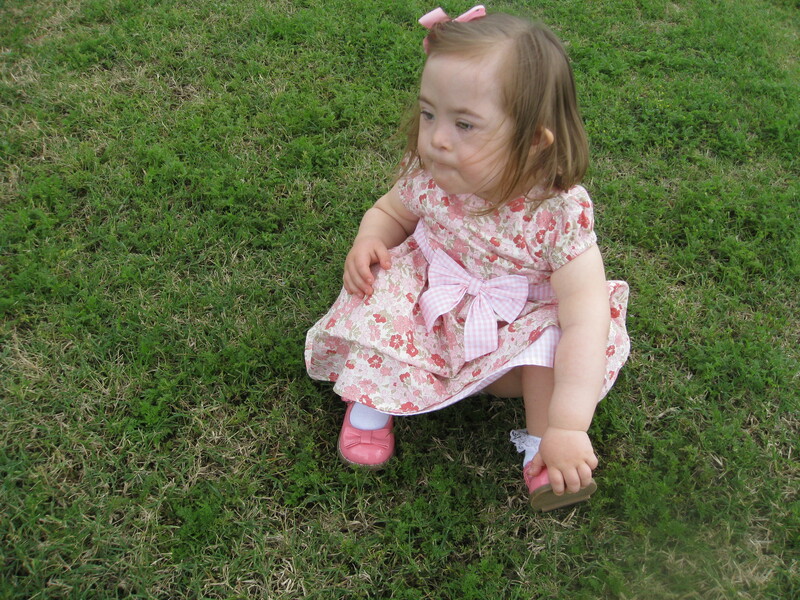 For though her development is obvious, it is also, due to her Down Syndrome, both skewed, and mysterious. You see, I’m not a book reader when it comes to my kids. Some part of my soul quietly dug in its heels early on, and I’ve been resisting the experts ever since. The downside of this is that I spend a lot of time learning things the hardest possible way. The upside is that my instincts are my own. So, of course, I could study up and nail down the developmental mileposts Hallie is likely to hit, and as far as her physical development goes, we’ve pretty much done that. But the growth of her inner world leads down a more tenuous path, and rather than burying my head in someone else’s map and fretting over every missed turn, I prefer to let my daughter lead. Her ways are not direct. After building herself up early on to a solid 15 word vocabulary, she more recently seemed to reach a dead end. Undaunted, she did what any sensible explorer would do: she turned around and headed back the way she came. And so we watched much of her early knowledge dissipate over the past year until we were back to “Da-da “, “Ma-ma”, “Up” and “Done.” She even stopped saying Heath, for the longest time her favorite word. But lately she seems to have found a new path, one that has taught her to walk, to sing, and to discover the word “Yeah.” At this moment in time, this one syllable is her true medium. Although her intonation is limited, “Yeah” functions as more than just a sound she can repeat. She uses it to answer questions. She uses it for emphasis. She uses it appropriately. She uses it. And for the first time, it feels like language. I enjoy being lost, which is a gift. For this is how we travel. Up in the morning, diaper change and breakfast. And then Hallie begins her journey. I follow as she ambles along, her lurching gate growing in ease and strength with each passing day. Despite her continued negotiations with gravity, she moves forward with joy and determination, smiling upon her world and brooking no obstruction. She turns back only to make sure I’m still with her, and then, purpose renewed, she heads deeper into the beguiling labyrinth through which she is my only guide. The air was cold when I stepped outside, but the sun was up, slowly revealing the quiet morning streets. I’m not good in the dark. My vision’s not great, and the farthest reach of my run, south of the park, is a little sketchy. So the light is welcome, and it combines with my new fleece hat to make the calm, seventeen degree air tolerable. Stepping over a mound of crusted snow into the dry street, I start the timer on my watch, and slowly begin to lope, giving my stiff calves a chance to warm up as I head toward the corner. Hallie’s white cell count is low. Her pediatrician had us wait a month. We redid the test. Still low. Children with Down’s Syndrome have an increased incidence of leukemia. She has none of the symptoms and her pediatrician says it is not an immediate concern. We have an appointment with a hematologist in a couple weeks. Steps are being taken. There is no need to worry. Nevertheless, her white cell count is low. The first stretch of the run down Ditmars Boulevard is the most tedious. Narrow sidewalks, few businesses, no trees. That’s the reason I head this way. I like to do the hard part first. I’ve been trying to teach this to Heath, but he’ll have none of it. He much prefers to kick his troubles down the road. I understand this, I used to be the same way. But it’s so much better to save the best for last. This hard won wisdom does nothing more than bounce off the wall that is my son. But I keep trying. Repetition is my friend. That’s what I tell myself. I was hoping for a red sunrise, that rare gift of cold winter dawns. A couple times a year I’ll catch one of these; the sanguine light silhouetting the trees and houses above the park. But today was not my day. Turning away, I followed the icy path down toward the East River. The path had been clear the night before, but this morning small drifts, a few inches deep, covered the asphalt. I bounced through them, hare-like, moving quickly to keep the snow out of my shoes. Fully warmed, the running came easy now, and, despite my lack of exercise over the past weeks, I moved through the shadow of the bridge with a grace I had not earned. Hallie was up late last night, climbing repeatedly out of our bed, scooting into the living room, planting herself in front of the T.V. and complaining loudly for more Elmo. I awoke to find her there, having worn her mother out, all quiet innocence as it approached midnight. I scooped her up and took her into bed, where I turned off the lights and laid her on my chest. She was still for a moment, but then lifted her head and tried once again to climb down. She rested for a moment, and then rolled over into the crook of my arm. I pulled her close and began, softly, to sing. Slowly, she relaxed, rolling onto her side. I rolled too, gently patting her bottom in time to the song. We watched each other. Her eyes began to flutter, then close, and soon she was asleep. I crossed 9th street, stepped up onto the sidewalk and turned left, running south along the river. A battered DEP ship was riding low as it made it’s way upstream, and I thought, “That would be a good life, sitting inside a warm cabin, drinking coffee on a cold winter morning.” Beyond I could see Manhattan, it’s buildings just beginning to warm. When life overwhelms me, my focus narrows. It’s imperceptible at first, but then it dawns on me, as I hunch my way through the day, that I am seeing little more than pavement, feet, and whatever is going on inside my head. Running is the antidote. The cold air in my face, the deep, chest-expanding breaths, the alertness needed to move quickly through a slippery world; all combine until suddenly I can see it all: sun, water, and sky; the whole gorgeous 360 degree panorama that is my world. At some point during the night Amy moved Hallie to her crib. Shortly thereafter she was replaced by her brother, who, god love him, seems to be nothing but elbows and knees and is about as easy to cuddle as a cinder block. So when 5:30 rolled around, it was remarkably easy to get up, put on my running clothes, and step out into the cold. I know where I’m going when I run; the route is set. Thirty minutes takes me through varied terrain and at the end of that time a journey has been made. It is both well defined and wholly unpredictable. I never regret it. And it always brings me home. Stumbling into Monday morning, I attempted to prop myself up with what turned out to be the highly volatile combination of yerba mate and Grooveshark. As a result, I spent much of the next two days ecstatic over the recent recordings of Glen Campbell. But with his diagnosis has come an unexpected outpouring of support, especially from his school. And as with Hallie’s birth, I am reminded that we are not alone, and that any walls between myself and the larger community are largely self-built. And speaking of Hallie, she took her first steps! Two wobbly lunging steps from her therapist’s arms to mine, grinning from ear to ear the whole time. A year and a half after most children walk, and a good six months after those with Down syndrome, she is, as always, happily doing things in her own time, and redefining “normal” for us all. I believe she see’s this as her job. As for Amy, we don’t see much of each other these days. Any time we have is filtered through the needs of these two raucous beings who have hijacked our lives. But she is good at Christmas, and preparations are afoot. Hopefully, sometime soon, we’ll find some time alone. That would be the best present of all. So deck the hall’s, roast some chestnuts, jingle your bells, and hark those herald angels. And if you get a chance, check out the most recent Glen Campbell album. It is awesome! Caterpillars are becoming butterflies. Five little cocoons hang from the side of a mesh cage in Heath’s bedroom, and we are counting the days until they emerge. Arriving in the mail in a small plastic cup loaded with enough food to sustain this transformation, the five larvae grew rapidly over the past week before attaching themselves to the lid, assuming the much-anticipated J shape, and, in a matter of hours, encasing themselves in a dense brown shell of their own making. Having moved them to the larger butterfly cage, we wait. Patience is not a word that leaps to mind when I think of my son. But his imagination, so tightly coiled around all things celestial for the past year, has begun to expand, and as the school year ends and he moves beyond a teacher who never appreciated all that makes him special, he has begun to relax. With the addition of a new pair of glasses and a daily squirt of Nasonex, the world is regaining its clarity and my little boy is finding the sweetness and vulnerability he has buried beneath anger for much of the year. And his sister senses this. Hallie Jake. We loved the idea of a little girl with such a rakish name, redolent of wise-cracking 1930’s aviatrixes, Amelia Earhart & Kate Hepburn rolled into one. The kind of woman who could hold her whiskey, throw a good punch, and stand toe to toe with any man. A woman who was smart, independent and, above all, strong. Which I have no doubt Hallie will be. For she is fast becoming a spunky, resilient little girl whose buoyant spirit has become a mainstay in all our lives. My own feelings for her are, at times, so fierce as to be bewildering. I had heard somewhere that in times past Downs children, considered imbeciles, were often abandoned to orphanages where their heads were shaved and they languished under the minimal care such institutions offered. What haunted me about this story was the lack of love, horrible for any child, but somehow more so for a child who has a greater struggle to understand. They must have felt unloveable, as if they deserved their loneliness. So in those first confusing hours, when I had no idea what else to do, I vowed that Hallie would feel loved. And to this day, when I hold her close as she’s falling asleep, I whisper in her ear, so she’ll never forget, “You are much loved, Hallie Jake. You are much loved.” This simple invocation, and the feelings it inspires, has lead to places in my soul I never knew existed. It’s as if, after living my entire life in a small apartment, I’ve opened a door to discover a palace. And now, days away from her second birthday, the love she’s received has begun to blossom. I can see it in her eyes, especially when she looks at Heath: her hero, her brother, and her best friend. As we move into the early heat of summer, Heath is keeping an eye on his five little charges, waiting for them to begin their gentle struggle toward a new life. He’s not going to want to let them go. I can see it coming. And although I remind him daily that all creatures long to be free and that if he keeps them too long, they will die, I know he doesn’t believes me. But, we’ll see how it goes. That’s a battle for another day. In the meantime we await the beating of newfound wings. So Heath frequently intones in his stately British accent. Our tow-headed purveyor of galactic doom, obsessed with all manner of star death, has memorized a BBC video, and this phrase has become something of a mantra for him, and, secretly, for me as well. For you see, I am now forty seven years old, and it has been eight years since that glorious time when I both ran a marathon and appeared onstage in a bathing suit, feeling, as a result, young and lithe. Since that time I’ve learned a few things about gravity myself, and they are not very pretty. Without my shirt I’m beginning to resemble those burly old guys who trot their bellies into the icy waters off Coney Island every New Years Day to frolic about like over-fed otters. When it comes to my midsection, gravity has, indeed, gone mad. And while this cruelest of forces is slowly dragging my pendulous bits earthward, it also continues to keep Hallie’s diapered behind planted firmly on the ground. Approaching the age of two, her standing is slowly improving, but walking is still but a dream. Of course, this bothers her not a bit. She knows little of gravity and cares even less. In an unwitting reenactment of Newton’s watershed moment, a dustbuster recently fell on her head. Far from bringing enlightenment, this merely riled her and, after a brief cry and a little soothing, she continued on her way, scooting across the floor in search of objects to scatter, raging at the universe in a language all her own. Amy, of course, is affected by gravity not all, being a creature of light, air, and occasionally fire. The sun to our planets, she warms us when we are cold and lights our way when we are lost. I see it most with Heath, who struggles with an outsize temper, disowns us frequently, and yet yearns to be near her constantly. She never forgets this, even under the most trying circumstances, and I, with a temper of my own, learn by her example daily. I often wonder how I’d handle fame and fortune. So many men crumble under the weight of what seems, at my great distance from either, an amazing gift. I know my weaknesses, and I’m sure I’d stumble a bit, but I doubt I’d fall. Because somehow Amy, Heath, Hallie and I have managed to create a universe that spins at just the right speed to keep the stars glittering, the black holes at bay, and my feet on the ground. So let the testing begin. I am more than ready. When I wrote this a year and a half ago it seemed a little too personal to publish. Now I can’t remember what I was afraid of. My daughter is beautiful. Don’t get me wrong, she has her squishy-faced moments. But when I’m holding her to my chest and she pulls back to look up at me, her little chipmunk head slowly drifting back and forth as her pale blue eyes linger on mine, I would happily hold her forever. When we learned Hallie had Down Syndrome my secret fear was that she would be ugly. It seemed a shallow feeling, so I didn’t talk about it. But it was there. I remembered those sad old couples from my childhood who waited a little too long to have children and were rewarded with a son or daughter who seemed large, clumsy, and yes, ugly. With our son Heath we had hit the jackpot. Fair haired, blue-eyed and whip smart. He got the best of both of us and from the moment he entered the world his beauty was apparent. But as crazy as I am about him, I do not remember him possessing his sister’s haunting, open gaze. It’s easy to be a beautiful baby, and god knows that some combination of glasses, braces and acne lie down the road for both my children. But it doesn’t really matter, now. They’re my kids, and they’ve taught me how to see. I have always been short-tempered with those who want me to brace for the worst. And yet, In the first days of Hallie’s life, I did it to myself. The hurdles seemed endless and I braced for them all. But three months later they are falling away. There will be tough times, I know that. But I’ve begun to relax, to roll instead of brace, to accept my daughter for exactly who she is with all her strengths and limitations. And it’s so much easier than I ever expected.